Leftist Professor Calls for All White People to "Commit Mass Suicide" — Condition Yellow: Stay Alert. Stay Alive. If you're a true conservative, you believe in self-reliance and self-preservation. That's why it's so easy to spot a leftist -- everything they stand for utterly destroys these principles. Wanna make money? Increase the minimum wage and build a welfare state instead. Wanna protect yourself and your family? Disarm the populace and grant leniency to criminals. Wanna free country? Expand the government, and so on and so forth. Every so often, however, an example of the leftist mental disorder comes along that is so insane that it can't be ignored. You know you've encountered a true leftist when they insist on ideas that completely negate the idea of self-preservation. 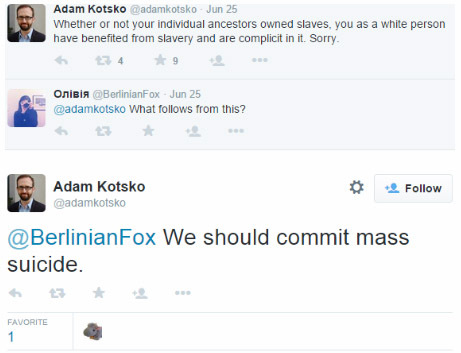 Adam Kotsko is an assistant professor at Shimer College in beautiful south-side Chicago (known of course for the efficacy of their gun-control laws). Dubiously hailed as "America's Stupidest College Professor" by the Daily Caller, Professor Kotsko came under fire in 2015 for stating that the Islamic terror attack on Charlie Hebdo was unsurprising because it's "a newspaper devoted to hate speech." Charlie Hebdo is categorized as a "far left-wing" publication. With employees like Kotsko, it's no surprise that Shimer College was ranked one of the 20 worst colleges in America by Washington Monthly. Earlier this year, Kotsko wrote a bizarre tweet in which he suggests that all white people are complicit in slavery because they "benefited" from it. Presumably, this would also include any white infants being born right now. Kotsko suggests that the solution moving forward is for white people to commit mass suicide. If ever there was a demonstration of a leftist's lack of self-preservation, this would be it. ... Are white people who immigrated from Europe long after slavery ended in America also complicit? If we’re wringing our hands over incidents that happened over a century ago, why not events that are more recent? Is every Japanese person responsible for the Nanking Massacre, or every Muslim personally responsible for 9/11? Where exactly is the line? Imagine for one moment if he had written the same thing about black individuals or, say, Jews or Asians. The racism coursing through his veins is so thick it’s a wonder he has a detectable pulse. Forget that “whites” — to use his term — are almost solely responsible for building the same grand civilization that allows him to comfortably tweet his hateful nonsense. Of course, one of the unspoken tenets of the left is "do as I say, not as I do," as we've seen in far too many cases. In all likelihood, Kotsko won't be leading through example any time soon.